As a personal injury and truck accident lawyers in Milwaukee, our team at Murphy & Prachthauser have experience working on a number of loading dock injury cases. Here are some of the key facts you should know about proper loading and unloading procedures. What Happens At A Loading Dock? With a few exceptions, truck drivers normally do not do the loading or unloading of their own trailers. The loading responsibilities typically fall on the dockworkers at any given facility. The facility will often have forklift trucks and other specialty vehicles and items for unloading a trailer. Depending on the truck cargo, additional items, like tarps, boxes and pallets, may be required. In the majority of facilities, dockworkers and forklift drivers are responsible for overseeing the safe loading and unloading of the truck cargo. 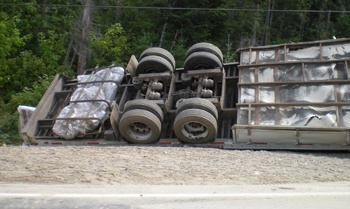 What is the Truck Driver Responsible For? The truck drivers are responsible for safe transportation and delivery of their cargo. One of the key factors drivers need to consider is ensuring that their load is balanced throughout the trailer. They do not want a disproportionate amount of weight on one side of the trailer, or over one axle. Additionally, they want to make sure they have a secure load. And lastly, they need to make sure they are picking up and dropping off everything they are supposed to. If you’ve been injured on a job site, loading dock or while operating a forklift, please consider our free case evaluation to determine if you are entitled to compensation. Dock areas have various requirements for what truck drivers may do while their truck is being loaded or unloaded. Some facilities leave it up to the driver, whether to sit in the cab of the truck, or come into the dock area. Some docks, especially if there are multiple forklifts operating at the same time, prefer to have driver’s wait inside of their cab. The forklifts move cargo at a fast rate, and allowing the driver into a fast-paced work area presents many hazards. Some facilities, if they have enough space and they can safely accommodate a driver, prefer to have the driver watch their trailer being loaded or unloaded, so that the driver is okay with the positioning of the pallets and can observe that the truck is loaded and unloaded appropriately. Individual facilities usually make these on-site protocols and communicate their preferences to truck drivers. Truck drivers are expected to comply with such requests. One specific type of loading dock truck accident occurs when the truck driver leaves the dock while a forklift driver either is fully or partially in the trailer. These types of circumstances fall into a genre of personal injury cases known as ‘premature departure’ cases. For unknown reasons, the driver thinks the loading process is complete, and drives away from the dock to give a final look at the load and close the doors. The safe way to proceed requires the driver to look into the trailer, and look under and around the truck to make sure that everything is done and it is safe to move the rig. We have experience successfully handing these types of cases, and we would be happy to help answer your questions. If you’ve been injured on a job site, take two minutes to complete an online free case evaluation to determine if you are entitled to compensation. Drivers are not born with the proper skills to operate a car, truck or anything in between -- all drivers need training. One of the things we always pursue on trucking accident or injury cases is the schooling that drivers are provided with, and remarkably, we typically find nothing in their programs regarding loading dock procedures. In fact, we have seen companies with reports of premature departure incidents, but they still do nothing to inform their drivers of this problem or take preventative action. Having said that, truck drivers are not always the cause of injury or accidents on the job site. Another type of accident that we often see involves truck drivers getting hit or otherwise injured by a forklift driver. Sometimes a wheel may run over a foot, or a pallet may fall over --but in many cases, the forklift driver is responsible. In any facility, it is important that all motorized vehicles drive in a safe manner, and keep their load under control. Many times surveillance cameras cover the dock areas, and it is important to preserve that evidence before it is tapped over, or removed. On site inspections and watching videos, I have personally observed many forklift drivers traveling at excessive speeds, not looking when they are backing, or otherwise driving about in a dangerous fashion. These injuries happen, and they are entirely preventable. If you have a truck accident case you would like to speak to a Milwaukee personal injury lawyer about, please contact us to schedule a free consultation and get an experienced team working on your behalf.